Navagraha Peeda - How To Overcome Navagraha Peeda? Navagraha Peeda results from the bad positioning of Navagraha or nine planets in a person’s horoscope (birth chart or janam kundli). 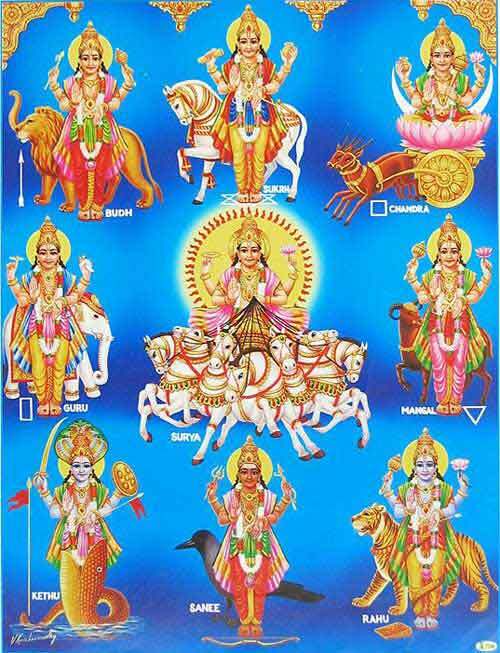 The Navagrahas are Surya, Chandra, Mangal, Budh, Guru, Shukra, Shani, Rahu and Ketu. A person having Navagraha Peeda in horoscope will face health troubles. To alleviate it, astrologers suggest various observances, yantra, mantras and ratnas. Navagraha Peeda and its solutions are followed by people who believe in astrology. It must be noted that a vast majority of Hindus ignore the Navagraha Peeda. How To Overcome Navagraha Peeda? Those people going through Navagraha Peeda have to chant the particular mantra associated with the Graha and observe prayers and fast. For example a person suffering Surya Navagraha Peeda a person has to observe fast on Sunday, read the Ravivar Vrat Katha, donate clothes and feed a hungry person. Apart from this some people also wear gemstones for the particular graha. It is also believed that offering prayers to Hanuman and Shiva will help in overcoming Navagraha peeda. This is because devotees of Hanuman are not harmed by the Navagrahas. Hanuman had got this boon. Shiva has control over the Grahas and therefore his devotees also remain unharmed. A popular prayer chanted is the Navagraha Peeda Hara Stotram. The most apt way to overcome Navagraha peeda is to have unwavering devotion to your personal deity. Do not allow the mind to enter into a negative state. Word hard without thinking about results. Improve concentration and achieve single-minded focus. Avoid giving too much importance to horoscope etc.